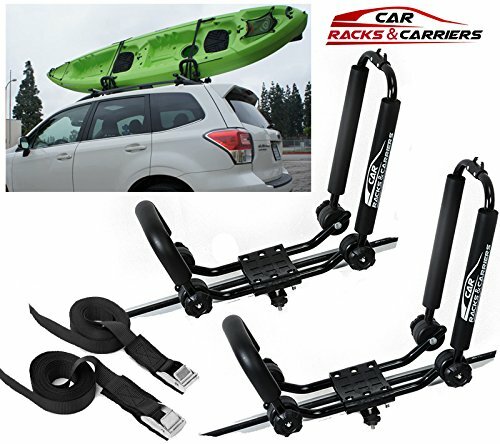 Car Rack & Carriers Universal Kayak Carrier Car Roof Rack Set of Two J-Shape Foldable Carrier for Canoe, SUP and Kayaks mounted on your SUV, Car Crossbar by Car Rack & Carriers at Kerinci. MPN: CAR-DOUF. Hurry! Limited time offer. Offer valid only while supplies last. Your satisfaction is the most important to us and we offer limited warranty for our kayak rack carrier.PLEASE CHECK MEASUREMENTS BEFORE PURCHASE. :The crossbars shown in the pictures are not included. Authentic car rack and carriers products contain vacuum sealed installation hardware. Authentic car rack and carrier products are shipped in labeled boxes with item description (as shown in picture).